In 12-inch skillet, melt margarine over medium-high heat. Add turkey strips; cook 4 to 5 minutes, stirring constantly, until no longer pink in center. 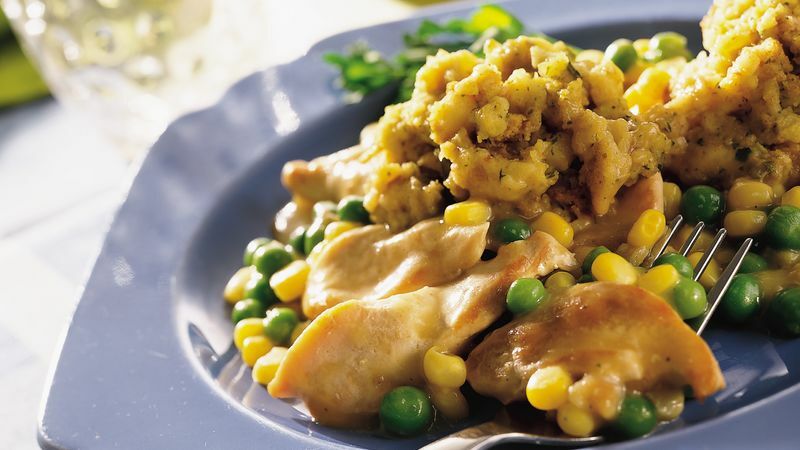 Add gravy, water, corn and peas; mix well. Heat to boiling; stir. Reduce heat to medium; cover and cook 6 minutes. Meanwhile, prepare stuffing mix as directed on box, omitting margarine; mix well. Spoon stuffing into eight 1/4-cup mounds on turkey mixture. Cover; cook over medium-low heat 8 to 10 minutes or until stuffing is thoroughly heated.